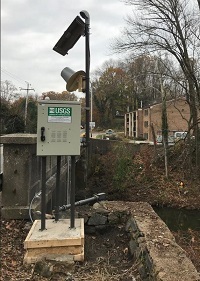 LOCATION.--Lat 39°55'44", Long 75°16'22", referenced to North American Datum of 1927 Delaware County, Hydrologic Unit 02040202, on left bank, 5 ft upstream from bridge on West Providence Rd, 2.3 mi upstream from Cobbs Creek, 8.4 mi above mouth. PERIOD OF RECORD.--Discharge: February 1964 to September 1990, and November 2019 to current year. Water Temperature: July 2000 to September 2000, and November 2018 to current year. GAGE.--Water-stage recorder, crest-stage gage, concrete control, and water-temperature sensor. Datum of gage is 18.9 ft above North American Vertical Datum of 1988(NAVD88), from GPS survey. COOPERATION.--Station established and maintained by the U.S. Geological Survey. Funding for the operation of this station is provided by the U.S. Geological Survey -- Next Generation Water Observing System (NGWOS). Add up to 2 more sites and replot for "Temperature, water, degrees Celsius, [Iridium transmitted]"